Previous observational studies have found that PPI's are associated with an increased risk of hospitalisation for community-acquired pneumonia (HCAP). However, these studies are confounded by gastroesophageal reﬂux disease and protopathic bias. Such confounders could be overcome by studying patients prescribed PPI's as prophylaxis for NSAIDs. In this issue of Gut, Filion et al performed one of the largest studies ever on this subject. They formed eight restricted cohorts of new users of NSAIDs, aged ≥40 years, using a common protocol in eight databases (Alberta, Saskatchewan, Manitoba, Ontario, Quebec, Nova Scotia, US MarketScan and the UK's General Practice Research Database (GPRD)). After adjustment, PPIs were not associated with an increased risk of HCAP (OR=1.05; 95% CI 0.89 to 1.25). Histamine-2 receptor antagonists yielded similar results (OR=0.95, 95% CI 0.75 to 1.21) suggesting a lack of dose-response relationship between potency of gastric acid suppression and the risk of HCAP (table 1). The authors conclude that concerns regarding HCAP should not inﬂuence prescribing of gastric acid-suppressing medications⇓. A unique feature of the human intestinal epithelium is that it continually renews itself. However, the mechanisms responsible for guiding this process are not well understood, partly because of the lack of adequate experimental systems to study the renewal process. A research team led by Mark Williams now reports on a system in which they can grow isolated human colonic crypts ex vivo in 3D culture conditions. This has allowed them to investigate the regulation of stem cell-driven tissue renewal by canonical Wnt and TGFβ/BMP pathways in the native human colonic epithelium. They have found that there are distinct activation profiles for canonical Wnt, TGFβ and BMP pathways and that there is a population of intestinal LGR5/OLFM4-positive stem/progenitor cells interspersed between goblet-like cells within the crypt-base. They have found that steady-state tissue renewal in the native human colonic epithelium is dependent on canonical Wnt signals combined with suppressed TGFβ/BMP pathways. They have also found that the stem/progenitor cell proliferation is uncoupled from crypt cell migration and shedding and is required to constantly replenish the crypt cell population (see figure 1A,B). Hierarchy of stem/progenitor cell proliferation along the native human colonic crypt-axis. (A). Dual in situ hybridisation and immunolabelling of lgr5-mRNA (red) and OLFM4 protein (white) identifies a population of lgr5-mRNA+/OLFM4+cells at the base of native human colonic crypts; E-CAD (green) demarks crypt cell membranes; filled white arrows indicate cells exhibiting intense fluorescent labelling for lgr5-mRNA and OLFM4; open arrow denotes nucleus of pericryptal myofibroblast; asterisk signifies a goblet cell with nucleus in the confocal image plane; scale bar—30 mm. (B). Quantification of cell types according to stem cell marker expression and cell morphology along the crypt-axis (see online supplementary figure S1 for an example, of lgr5-mRNA/MUC-2 double labelling); the congruence of OLFM4 and either lgr5-mRNA or LGR5 protein expression was 96%±4% (mean±SD, n=20 microdissected crypts from N=4 subjects). The claudin family of proteins is integral components of the intestinal epithelial tight junctions. 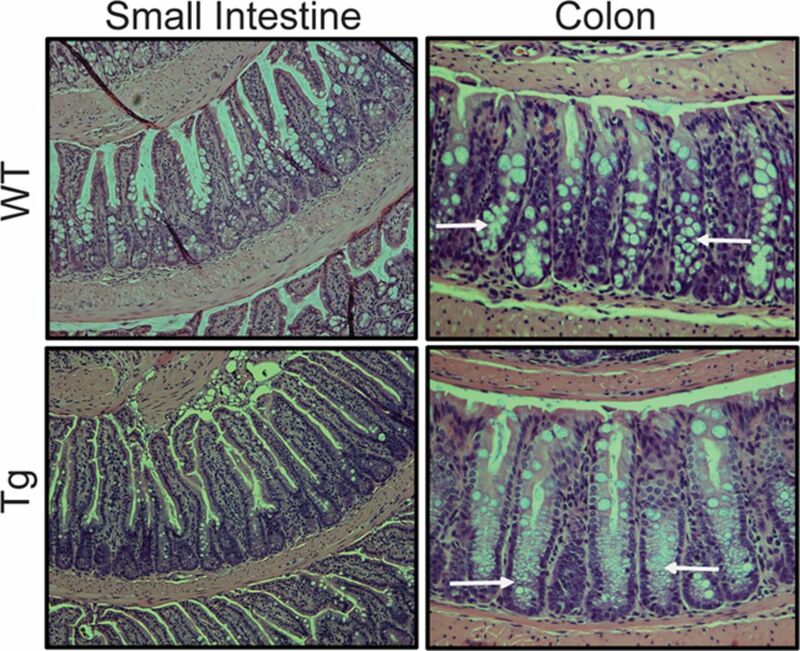 Claudin-1 expression is increased and dysregulated in colorectal cancer and intestinal epithelium. It is causally associated with the dedifferentiation of colonic epithelial cells, cancer progression and metastasis. Dhawan et al have now created a mouse model that over-expresses claudin 1 so that its effects can be studied in vivo. Her team has found that overexpression of claudin 1 disrupts the normal colonocyte differentiation programme causing loss of goblet cells and decreased mucin production. These mice were susceptible to chemically induced inflammation as well. Increased claudin 1 associated with dysregulated Notch signalling and MMP-9 expression, which have been implicated in colon cancer. Their findings provide insight into the role of claudin-1 in the regulation of inflammatory bowel disease and colorectal cancer (see figure 2). Representative H&E staining for the colon of WT and Cl-1Tg mice. Jesus Prieto and his group (see page 665) observed a specific down-regulation of IL-7 and IL15Rα in the liver of HCV patients and showed that this was related to a down-regulation of IRF2 but not of IRF1, two transcription factors normally involved in the stimulation of these genes. Using HCV replicon cells (genotype 1b) they confirmed that HCV affects the expression of IRF2, IL7 and IL15Rα. These data reveal a new mechanism by which HCV abrogates specific T cell responses and point towards a novel therapeutic approach to stimulate anti-HCV immunity (see figure 3). Interferon regulatory factor 2 (IRF2) expression in human liver. 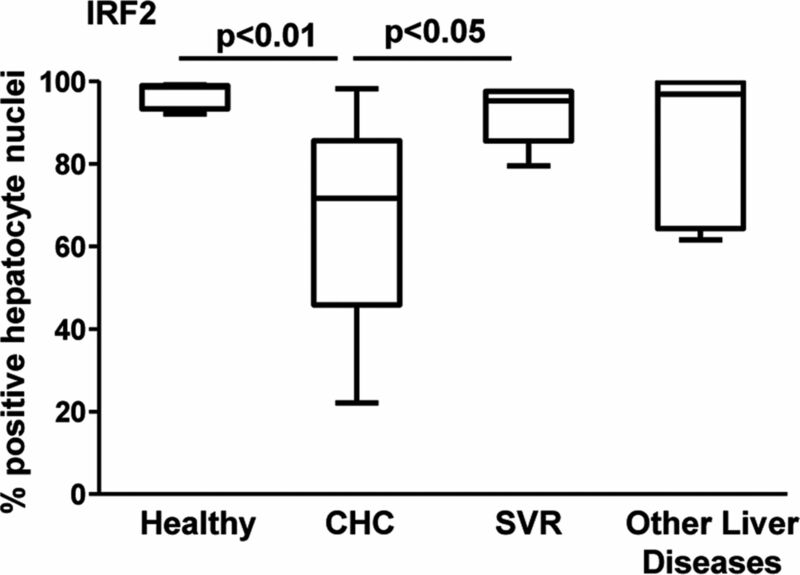 Percentage of IRF2-positive hepatocyte nuclei determined by immunohistochemistry, in liver samples from healthy livers, patients with chronic hepatitis C (CHC), patients withCHC virus infection who cleared the virus after therapy (sustained virological response; SVR), and patients with other forms of chronic liver damage. Keratin 19 (K 19), a biliary and hepatic progenitor cell marker, is expressed in a subset of hepatocellular carcinomas (HCCs) with poor prognosis. This prospective study from Leuven (see page 674) in 407 Caucasian patients with HCCs of various aetiologies provides further evidence that K19 is a critical driver of tumour invasiveness in HCC. Furthermore, using microarrays and microRNA profiling, they provide a thorough characterisation of the molecular phenotype of K19-positive HCC. Increased cell invasiveness and chemoresistance were identified as functional characteristics related to K19 expression in HCC cells. Thus, the study sheds new light on the mechanisms underlying the poor prognostic K19 phenotype, and supports the contention that K19-positive HCC should be considered as a separate entity.